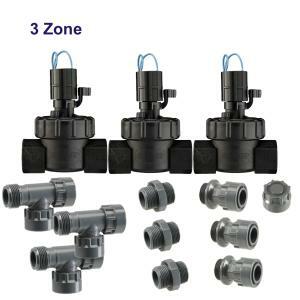 This 3 Zone 1" Manifold Kit is ideal for any installation that requires multiple zones. You can use any controller/timer that controls 24 VAC solenoids. The quick connect swivel fittings make installation a snap. No glue or wrenches, just hand tighten the swivel fittings and you're ready to go. The female swivel has an O-ring inside which ensures a leak-proof connection. Note: Manifold System Components are O-Ring Sealed, Do Not Use Paste, Dope or Teflon Tape.